If cats don't know back in September 2011, DC Comics completely retooled and relaunched 52 titles in their catalog to give them all a fresh start. Now first things first, I really never messed with DC Comics like that. Of course being born in '74 I grew up on the Justice League cartoon so I rocked with a handful of DC cats (basically just Batman) but when my cousin Tax put me onto Marvel it was a wrap for DC. But I figured since I'm back in the comic game from a LONG hiatus I might as well give these cats a chance. Now the crazy part of this whole story is what title I decided to start off reading first, which ended up being Aquaman. Aquaman? Yeah, Aquaman. I don't know why, but I always rocked with Aquaman on the low. Maybe cause at 37 years old I still can't swim and he can. Maybe cause he can talk to fish and I can't. Or maybe just cause he's the underdog of the Justice League and I've ALWAYS rocked with the underdog. It's like his powers compared to everyone else's are only good if they're rumbling somebody in the ocean. And how often does a superhero rumble someone in the ocean? It's like everyone disses this cat. Even my daughter dissed this dude! She asked me what I was reading and I told her Aquaman and she said "he can't even solve a crime underwater!" She actually got the joke from Disney's A.N.T. Farm TV show which proves my point even more that Aquaman gets absolutely no love if a kid's show on Disney is dissing him. And the funniest part about starting off with Aquaman is that the writers are well aware that everyone disses him because by page 6 at least 5 people dis him! I guess the writers decided to take what I call "The Rabbit Approach" (from Em's character in "8 Mile" when in the final battle he disses himself to take all of the ammo away from the dude he was battling) to the new Aquaman and just like in 8 Mile, it works. This series sets off with Aquaman giving up his seat on the throne in Atlantis to protect a bunch of cats who make fun of him. (mankind) He's also got his shorty with him, Mera who isn't as cool with all of the jokes about her man the way Aquaman is. I'm up to issue #7 and so far, I dig it. I think I've always rocked with cats who have a lot of hoopla going on in their life besides saving cats and fighting the bad guys and Aquaman now falls in that category. 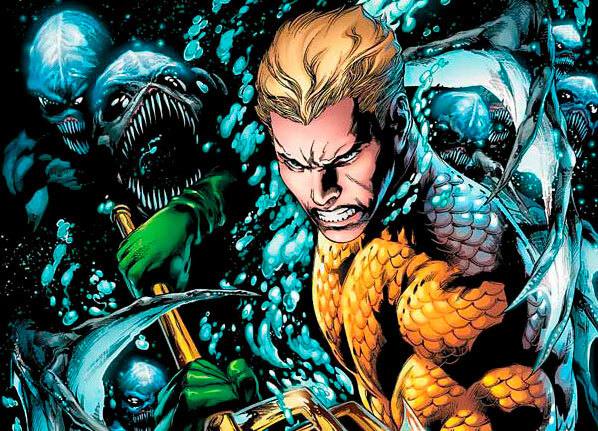 Now keep in mind, I JUST started rocking with DC comics so for all I know this may have always been Aquaman's storyline and if so, then I'm a little confused as to why NOBODY rocks with this dude! 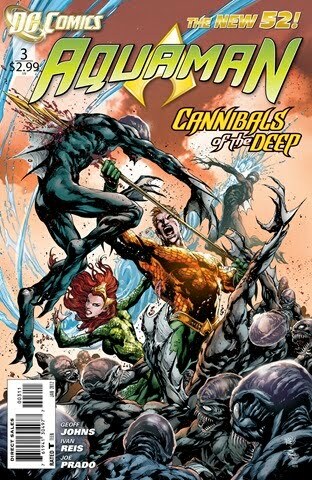 But even if you're just a 'lil intrigued about Aquaman's storyline, check it out...I doubt you'll be disappointed.